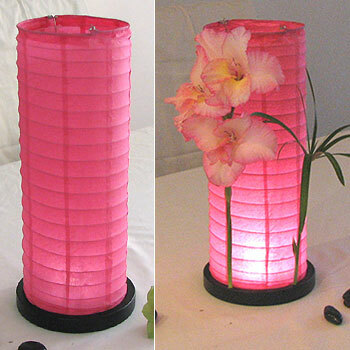 Table Centerpiece LED Battery Paper Lanterns in Rose Pink. Six bright-burst LED type bulbs nicely lit up the lantern centerpiece. Requires three AAA alkaline batteries that last for 22 hours. Solid wooden base is crafted with five pre-drilled holes for silk flowers, sprays or twigs(not included) decoration.